Offering a superior level of comfort, no matter how long the journey, you’ll be glad you made the choice to travel in a chauffeur-driven Mercedes Viano. Beyond comparison when it comes to transporting multiple passengers (up to eight people), and high volumes of luggage, the Mercedes Viano is a versatile choice for a multitude of travel requirements. High on comfort and low on compromise, your chauffeur driven Mercedes Viano comes with all the necessary elements to assist you in enjoying optimum relaxation during your journey, including armrests, adjustable back rests, and an abundance of leg room. In addition, the Viano’s semi-automatic climate control system makes for an ambient environment that ensures you arrive feeling fresh. The options provided by the flexibility of travelling via our chauffeur driven Mercedes Viano service, mean that you can plan for your journey, totally unhindered by restrictions. Perfect for large families or big groups, looking to travel to their destination with that added sense of refinement, the spaciousness of the Viano allows for an abundance of luggage to be catered for – there’s no need to leave anything behind. At TC Executive we find that our chauffeur driven Mercedes Viano is the perfect option for many of our clients, specifically due to its passenger capacity. The Viano is particularly useful for airport transfers, groups travelling to evenings out, shopping trips, hen/stag parties and weddings. 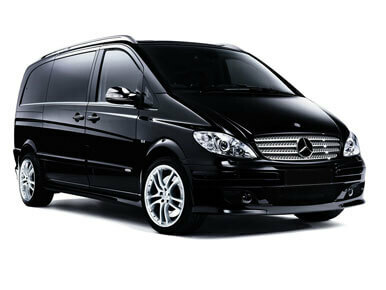 The Mercedes Viano seats up to 6 passengers, perfect for travelling with friends. This doesn’t compromise the interior space, comfort or luxury, though. There is plenty of space, adjustable arm rests and seats and other things that you would come to expect from TC Executive Cars.